So you walk outside of your house one day to see a strange man leaning over what looks to be your….dead dog?? The man stands up slowly and turns around, and in one blinding flash of terror you see your puppy’s mangled brain spilling out of his mouth. The man’s eyes are lifeless, and his flesh is falling off his bones. You realize it in an instant. HE’S A ZOMBIE. You don’t panic. You’ve been training all your life for this very day! The zombie, obviously not satisfied with mutt brain, starts hobbling toward you, hands outstretched just like the zombies in the oldest, cheesiest zombie movies you’ve ever seen. You almost start to laugh, but it’s getting closer, so you run for the door, through the house, yelling “SUPERCALIFRAGILISTICEXPIALIDOCIOUS!,” your agreed-upon code word in the case of the zombie apocalypse. Your parents and sister come running down the stairs, yelling the same word in response, and the four of you rush into the kitchen, where you start boiling pots and pots of water. You take a peek out the window and see the zombie awkwardly trying to turn the door handle. You have plenty of time. Your mom hands you a giant key, a key you thought you might never get to use. You unlock the giant padlock that is holding shut the biggest of the kitchen cabinets. Inside are hundreds of boxes of spaghetti noodles. It takes the whole family to pour as many noodles as possible into each of the pots, and you begin to make as much spaghetti as humanly possible, piling all of the cooked noodles on the kitchen table. Your sister is stirring the agreed-upon mixture of alfredo sauce, sour cream, jello mix, and pink food coloring. Once the table is overflowing with noodles, you open the secret compartment in the very back of your noodle cabinet and pull out a very special bottle that says “Zombie Poison – May Contain Hazardous Chemicals.” You let your sister do the honors and watch as she pours it into the paste she has just finished making. Together, your family covers all of the spaghetti noodles in this pink paste and make a giant, squishy, pink blob in the center of your kitchen table. It looks an awful lot like…a brain. You motion for the family to hide, and they all get in their pre-assigned spots (fridge, oven, pantry). You sneak to the door, where the zombie is still trying to push the door open, and open it slowly. You run back to the kitchen before the zombie has a chance to see you. The zombie slowly enters into the kitchen, the floorboards creaking under its disgusting yellowed feet. It sees the spaghetti brain and perks up. You and your family watch it devour the entire thing, shoveling the noodles and the paste into its mouth. You snicker. You’ve won! When the zombie has finished the entire brain, it starts looking around the room for more. You wonder why the poison hasn’t worked yet. You remember the day your dad came home from the Dollar General with it and said it was “just as a precaution.” Wait a minute. Dollar General? You pull your handgun out of your back pocket, step out from behind the wall where you were hiding, and shoot the zombie directly in the forehead. One night, you’re out with your significant other. You just saw a rerun of “The Notebook” at a theater, and you’re feeling extra romantic, so you decide to take a drive. You drive out into the middle of the country, where you park in a cornfield. You both climb on top of your car and lay down, looking up at the stars and eating what’s left of your cold movie theater popcorn. Your significant other points out an extra-shiny star and you both gasp in wonder, holding hands and being all lovey-dovey. Your significant other is engrossed in the cold popcorn, but you continue watching the star. It’s moving. And it definitely looks like it’s getting closer. You tap your beloved’s arm, but they don’t look up immediately. The star is definitely moving downward, almost directly above you. You jump off the car, grabbing the popcorn and your significant other. The “star” is plummeting toward you now. You try to turn the car key, but the car won’t start! You curse your dad’s 81-year-old mechanic in your head. You’re panicking now. You push the key so hard that it breaks off in the ignition. You’re flipping kidding me. You scream and dive into the backseat as there is a huge BOOM and a blinding flash of light. As the smoke clears, you see what has just plummeted into the middle of a field: a giant, flat slab of stone. You get out of the car slowly and go over to inspect it. Your significant other is still trembling with fear in the car. You shake your head. The stone is surprisingly smooth, and as you run your hand over it, it glows blue. You remove your hand in shock. Suddenly, there is a loud hum and you look up to see a giant ship coming down from the sky, slowly descending toward the stone slab. Before you can fathom what is happening, you have to take a moment to admire the fact that an alien spaceship sent down a landing port before they landed. Ingenious. Your uncle was a crazy man. Crazy, but now, you realize, very smart. He was always convinced that life forms from other planets were going to attack, and hypothesized about thousands of different scenarios. He was obsessed. When he died, he left you one of his alien survival kits, which you had promptly put into the back of your car and left there to die. Thank God you kept it. You open the box and inside are two alien masks — both made of crappy plastic, very cliche-looking. Oh no, this is never going to work. The only other thing inside the box is a giant roll of old paper. You open it up. Inside are written the words “Find the control station. Press the self-destruct button.” You find it slightly strange that aliens would have a self-destruct button on their ship. It seems too simple. The rest of the sheet of paper is filled with various maps of where the button could be. You throw the paper back into the trunk. You can handle this. You hand your significant other one of the masks and motion for them to put it on. They groan but follow your lead. You both watch as the door to the spaceship slowly opens and you both sneak toward it. Nothing seems to come out, so you both walk up the ramp and into the ship. You pass a few aliens as you’re walking down the hall. Strangely, they look exactly like your cheap masks. Wow, Uncle was spot on. They don’t seem to notice you. Soon, you reach a room that certainly looks like a control room. Wait, there’s a giant sign that says “Control Room.” Aliens speak English? In the center of the room is a huge red button labeled “Self-destruct.” This is too easy. There’s no one in the room. You step up to it hesitantly and press it. A loud beep begins to sound throughout the ship. Oh no! You and your significant other race for the exit, speeding past aliens who don’t seem to be panicking at all. You get to the bottom of the ramp and the ship starts shaking. You run as far and fast as you can, not quite noticing the other ships that are descending down from the sky. You hear an explosion behind you, and look back to see the spaceship in smoking ruins. Too easy. You’re shocked that it worked. Boom. You just saved the world. As long as the other aliens get scared off by your incredible feat and never return to planet earth. It’s a rainy Monday morning. You’re in your kitchen watching the news with your best friend, Clara. Clara is a slightly strange friend. Her laugh is a little forced all of the time, and her eyes are a weird shade of gray that you’ve never seen on anyone else. She also doesn’t ever want to eat at your house. In fact, you’ve never actually seen her eat. Oh well! She’s cool. She has an endless supply of dirty jokes that sound like they’re pulled straight off of Google and can answer any trivia question in the world. What a cool friend. You’re eating your waffle and Clara is watching intently while you both listen to a news story about a sad dog with three legs and his transplant surgery from his dog mate. How touching. The reporter begins to cry. Suddenly, the transmission is interrupted by BREAKING NEWS! The headline reads “Attack of the Bots.” How intriguing! The reporter is speaking frantically, explaining how there has been an outbreak of rogue bots in Japan. They’ve finally developed the ability to think for themselves, and they look exactly like humans. Oh, the Japanese, you think to yourself. The bots apparently found a way to board a plane without being noticed, and just arrived at LAX, where they’ve already caused a frenzy. You turn up the volume, very interested in the story. Clara shifts in her seat and gets up, exiting the room. Probably using the bathroom. The TV report shows footage of the bots blowing up the airplane (at least after all of the passengers had exited) and pulling out guns in the airport. They didn’t shoot though. Interesting. They look exactly like humans! Crazy. The reporter says that it seems the bots are heading to downtown LA. You smile, thinking of your comfortable Midwest home. You’re in no danger. Surely the police will catch them before they reach you. Clara still hasn’t returned. “Clara?” you call. No response. Huh. You walk out of the kitchen and go upstairs to your bedroom, where Clara often likes to hang out. Sure enough, she is sitting on your bed, looking through your old photo albums. “Clara! There you are. Did you see that crazy story about the bots?” You look down and notice that a couple of your albums are sizzling on the ground, two giant holes plunging through them. “Clara!” Clara looks up at you, eyes blazing—literally, there are two lasers coming out of her eyes. Clara laughs a…very robotic laugh. She gets up and comes toward you. You reach behind you, pull your prized baseball bat off of the wall, and whack her repeatedly in the head. Metal chips scatter on the ground and she collapses. How did you not see this coming? Oh well. She wasn’t that great of a friend anyway. You drag her body out to the garage, realizing that you’d never given her a hug, and if you had, you definitely would have felt how metalic she was. Hadn’t given her a hug? What kind of friends were you anyway? You are very proud of yourself for your victory. Boom. You just saved the world. Well, not really. 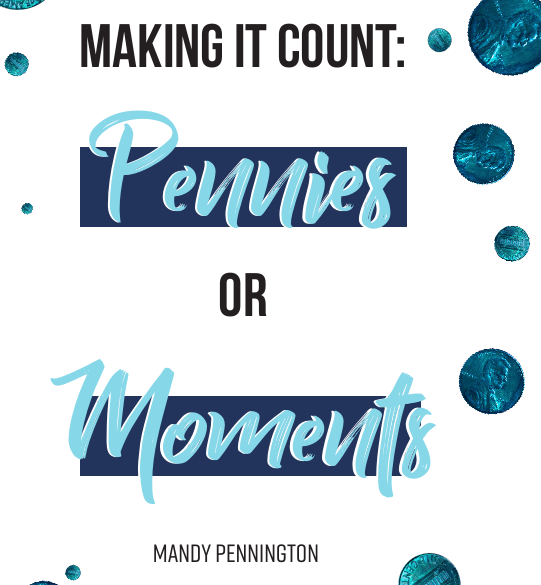 Making it Count: Pennies or Moments?